"Congratulations! We’ve made it through another spin around the sun." Indeed we have. Since we're at the end of the year, it's not uncommon to see endless tributes and retrospectives recapping the year. "Here's to 2014" is yet another, but it packs in more than just a few events. 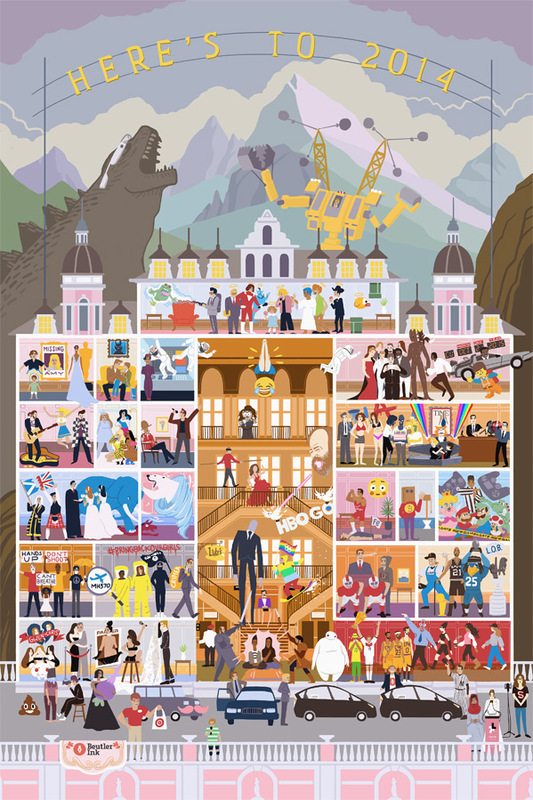 Made by the graphics company behind the 85 Best Picture Oscar Winners infographic we featured in February, called Beutler Ink, the graphic (seen below) includes references to nearly every major movie, pop culture moment, or news event, from Too Many Cooks to the death of Robin Williams, The Lego Movie, Interstellar and Ghostbusters, too. The only thing missing is some kind of reference to the Sony Hack, but The Interview guys may be in there. Take a look! From the poem on their website: "The Lego Movie made it hip to be square, and Matthew McConaughey was everywhere. We made some new friends and lost some old, We dumped ice on our heads and Malala was bold. And because you were good, here’s a little treat, An exciting, exclusive pop culture feat! A gift to you, from Beutler Ink: Here’s to 2014, see what you think!" Thank you to Beutler Ink for sending this over. I do wish it was a bit more movie-themed rather than news event-themed, but there's still plenty of references in there. Godzilla wearing Google Glass, and the Grand Budapest Hotel for the frame top it off. For other 2014 year end recaps, check out: Sleepy Skunk's Retrospective, 'The Movies of 2014' Video or Little White Lies. The Interstellar astronaut goes through the wall. That's clever. It's more of a pop culture extravaganza....I like how the top floor pays homage to some of the celebrities we lost in 2014.